A pie maker in Lincolnshire has been chosen to make festive pork pies for the Queen and Prince Charles. Nelson's in Stamford was established in 1924 but it took over from a butcher who had been in business since 1826. It produces thousands of Melton Mowbray style pies for the festive season and this year has been selected to send them to the royal household. Pie maker Ian Rawlins said the secret was in the quality of the meat and the seasoning they used. He said: "We are making two-pound pies for the Queen. They have coarse chopped pork, a bit of seasoning and that's it. "Most pies are done in tins but those for the Queen are formed round a traditional wooden mould. They have been done that way for centuries." Manager Guy Gilman said they were not taking the job lightly. "It's a great honour to be asked. It's a once in a lifetime opportunity to make a pie fit for the Queen," he said. Pies are cooked for about an hour-and-a-half, then allowed to cool before having jelly added. Food producers in the East Midlands have been campaigning for the Melton Mowbray pork pie to get the same legal protection as given Champagne and Parma ham. 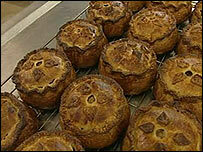 Melton Mowbray pies use uncured pork and usually had a grey colour compared to other pies available.